It has been a rough winter. Full disclosure... until recently, I hadn't run much since the Des Moines Marathon last October. And by much, I really mean at all. I can blame it on a million things, but mostly I was burnt out. November and December were the worst. It made me so sad, like a big-fat-pit-in-my-stomach sad, every time I saw someone running outside. I kept telling myself, "Oh it's this cold weather," or "I'm too busy driving my kids to activities," or "Work is demanding too much," but I knew. I knew deep down inside I was just making up excuses. Not running over the last few months had had several effects on me, none of them good. I had gained a little weight, I was unmotivated, I had more anxiety and, contrary to what I thought would happen, I had no more free time than I did before. If there is rock bottom of running guilt, I had hit it. Deciding that enough was enough, I recently found the strength to make a change. No more sulking in my sadness or harboring guilty feelings for being a quitter; I was getting my health and attitude back on track. My plan is simple: take things slow. When I dive in too quickly I always give up well before my goals are achieved. I started my goals one month at a time: January- eat better and start walking. I focused on whole foods and more protein. I walked on the treadmill some, but didn't make that a priority. I lost 4 pounds. This month, February, I have been continuing my eating goals but incorporating more walking and running. For accountability, I signed up for a 30 day wellness challenge at work and am already up to easily running 2-3 miles again after just 2 short weeks of walking or running every day. I am not focusing on pace at all, just mileage. The most surprising goal I added in this month was a gratitude challenge that I decided on a whim to take part in. Thanks to a fellow getting-back-on-track runner, blogger and newly published author, who I am also proud to call a life-long friend, I was inspired to start writing daily about what I am grateful for. 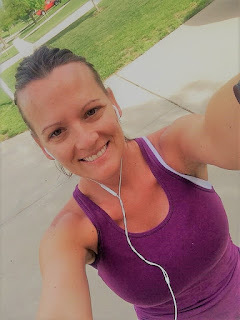 As I have written daily about topics she posts in our Facebook group page I am reminded of something... Running really still is part of who I am. I find that I continue to write about and find deep gratitude for my health and in particular, my hobby of running. I have two more weeks of both my gratitude challenge and my 30 miles in 30 days challenge, and I am hopeful I will finish both successfully. I will blog again next month to let you know if I finished and what new goals I will be adding into my plan for March. If you have been feeling like me, I hope this post gets you motivated to start a change somewhere in your life. You can do this! WE can do this. If you can't make a big change, make a small one. We have a marathon to train for after all!